Every year, scores of new artists get pegged as "The Next Big Thing." Few live up to the hype. Some exceed it. Even before their album streets, The Afters are generating a positive buzz in the Christian music scene and beyond - buzz their debut album lives up to. Consider: The band is the first signing on Simple Records, launched by MercyMe's Bart Millard and producer Pete Kipley in cooperation with INO Records. 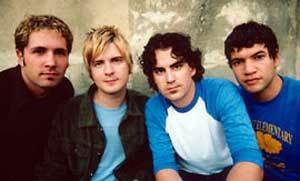 They're the opening act for MercyMe and Jeremy Camp's Undone tour, hitting 40 cities in spring 2005, and veteran Brown Bannister and up-and-comer Dan Muckala produced their album. Their debut project will also be released on Epic to the general market simultaneously with the Christian release, as well as a single to mainstream radio in 2005. But it hasn't happened overnight for these Dallas-ites. The foursome has spent seven years as an indie act, honing their Smashing Pumpkins-meets-Coldplay style rock as the house band at Dallas' legendary hotspot The Door. They consistently packed out that club, drawing 800 plus fans to their monthly gigs, selling more than 25,000 units of their indie project under their formal name Blisse, and became a staple on Dallas rock radio. The band's lineup includes Josh Havens on vocals, keys and guitar, Brad Wigg on bass and vocals, Marc Dodd on drums, and Matt Fuqua on guitars and vocals. Havens and Fuqua came together to play for a missions conference at Dallas Theological Seminary. After their show earned a positive response, they graduated to a club show. They later added Wigg, who had fronted a blues band, and Dodd, who worked with the guys at Starbucks. The band first came to Millard's attention when they opened for MercyMe at a Halloween show in 2001, recalls Fuqua. They made an instant impression on Millard, who says, "I was really nervous to follow them because they were so amazing. They're one of the best live bands I've ever seen." "As a band, they represent everything we desire to be about as a label," says Millard. Says Havens, "We really clicked with Pete and Bart. Their vision for us musically lined up, and because they were both artist and producer, they saw more what we saw." Their debut, I Wish We All Could Win, draws its title from track "Someday." Josh Havens says, "We're all in this world living our life, trying to do our best and trying to figure out why we're here," Havens explains. "Essentially, the album is about running the race of life. At the end of the race, there are winners and losers. I wish we all could win." Havens' father passed away in November 2004, and his death after a long illness brought home to him that the brokenness we experience was not the way the world was intended. "We were not created to die, to face these things, but when we die and receive God's grace, we'll be restored to the way He intended it to be," he says. Speaking about the chiming first single, "You," Havens said, "We should not find our identity in things of the world, but rather in Christ. If we live with Christ in us, He will give us confidence, strength and love. In difficult times, we can feel safe and secure knowing that our lives are in the hands of the very One who created us. And His love for us is greater then our minds will ever comprehend." Among other highlights on the album are the driving opener "Beautiful Love," which will be released by Epic to mainstream radio, along with the blazing rocker "The Way You Are," with its clever wordplay. Says Havens, "We want to encourage our listeners and ourselves to live our faith out in the world every single day, not talk about it, but back it up with our life. I hope we encourage people to live for something greater than themselves."